not an easy job to do. They need lot of cleanliness and a proper food to stay fit. They need to be vaccinated on a regular basis and can be prone to many diseases if proper care is not taken. Cause: This is the most common pigeon disease. It is caused by a microscopic protozoan which is mobile. It is transmitted from one bird to another through drinking water. The parent bird can infect its young ones through feeding. Symptoms: Infected bird shows a definite reduction in their activity, loss of weight, torn feathers, diarrhea, increased water intake. There are cheesy yellowish deposits in the mouth or throat. Young birds are more susceptible to this disease. Prevention: Maintain regular nutritional feeding and withering schedules. Sanitize the pigeon drinkers regularly. Observe and isolate any newly acquired birds for several weeks and administer an Anti-Canker drug or improver on a regular basis. Cause: This is a highly infectious and common pigeon disease which is caused by a protozoan. It infects the intestine of birds. It usually persists in all pigeons, but adult birds have developed enough immunity to this disease to remain fit and fine. Young pigeons are the targets of this disease. The birds which are subjected to severe stress that is racing, showing, and lack of food or water are prone to this disease. Symptoms: Infected birds have little or no desire to drink or eat. They lack in any desire to move and frequently close their eyes. Their droppings are usually loose, green in color and may become watery. There is loss of weight and death can occur in young birds. Prevention: Keep their lofts dry and clean. Do not allow feed to come in contact with droppings. Do not allow birds to drink water from mud puddles and keep water and feed free from contact with rodents. Keep the loft clean and dry. Feed pigeons with a diet consisting of pellets and seeds twice daily. Provide clean water for pigeons. Vaccinate the pigeons. Check their droppings at night. If the droppings are loose white or green then the pigeon is ill. Separate the ill pigeon from others. Keep new pigeons separately for few days so that they do not fall sick. It is important to take this step because disease generally comes from outside. Soak bird’s grain (feed) in water before feeding them for one week. This can be helpful for the pigeons who has weak digestive system Bacterial diseases are mostly contracted by eating infected food, or come from stings, bites, wounds or inhalation. Viral diseases arise from infected drinking water, from a sneeze from another sick bird or other airborne contact. Fungus diseases are spread by wind, water or contact. Protozoa, such as the Trichomonas which causes canker, are often carried by parent birds without any symptoms and are passed to their youngsters by mouth. Parasitic diseases are internal as the result of birds ingesting worms or their eggs, or external by contact with birds carrying on them some stage of parasite. It is essential that the fancier should have some understanding of the life-cycle of both types of parasite, because to control parasitic disease successfully this cycle must be broken. Pigeon diseases can be cured if they are treated at early stages. 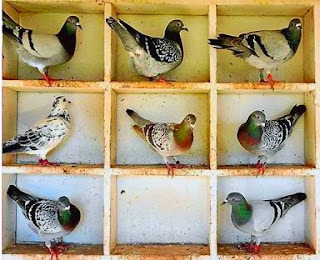 One needs to keep their pigeons clean by washing them on regular basis to prevent pigeons from getting infected.